The day you open your mind to music, you’re halfway to opening your mind to life. Back in the olden days, in the long-ago twentieth century, there was a teenage pastime called ‘Hanging around record shops’. The pastime attracted all types: the boys (mostly) and the girls (sometimes), the cool and the gauche, the loners and the gangs. What we had in common was a passion for music and an almost mystical yearning for escape, escape to the other realities that music promised. That moment when you started hanging out in the local record shop was a marker, not just of the transition from early to late adolescence, but also of an opening of the mind to new art, new experience, new possibilities. The enticing and complex world of adulthood seemed that little bit closer. Whether or not there was money in your pocket, hours could be spent browsing the record sleeves crammed into wooden bins, each one signposting a portal to another auditory world, some familiar, some half-known, others mysterious and exotic. The art of the record sleeve and the experience of the record shop are so entwined in my memory that one without the other is unimaginable. Each sleeve would be subjected to analysis and interpretation, from the cover art to the track names to the personnel, with a diligence that might have shamed an art historian. Of course this interpretation was never uttered: none of us was that articulate or that pretentious. The record shop was also a place to listen and learn, to hear music that was new and unfamiliar. Eventually the teenage browser would gain enough confidence to request that a certain disc or track be played by the staff. This exchange was fraught with difficulty and potential humiliation. Some of the staff regarded awkward kids like me, in our cheap jeans and anoraks, as time wasters. Others were more sympathetic. You got known eventually, as someone who bought (even if infrequently) as well as hung about. And once the stylus touched vinyl and the track began playing, everyone in the place would know that you had chosen it. This was no random act but a statement about you, about ‘the kind of stuff’ you liked. And once it was playing, to move ever so slightly by foot tapping or finger drumming, or to stand stock still, that was the question. One day back then, when I was buying a single, the bloke behind the counter complimented me on my choice. He pulled another from the pile on the counter, said, ‘I think you’ll like this one’, and put it on the turntable. This was an unexpected honour, and I was duly humbled and duly prideful. I had been admitted to the sodality, however temporarily. I felt almost grown-up for the rest of the day. But there are a few remarkable survivors, and one of these is Spillers Records in the Morgan Arcade in Cardiff. 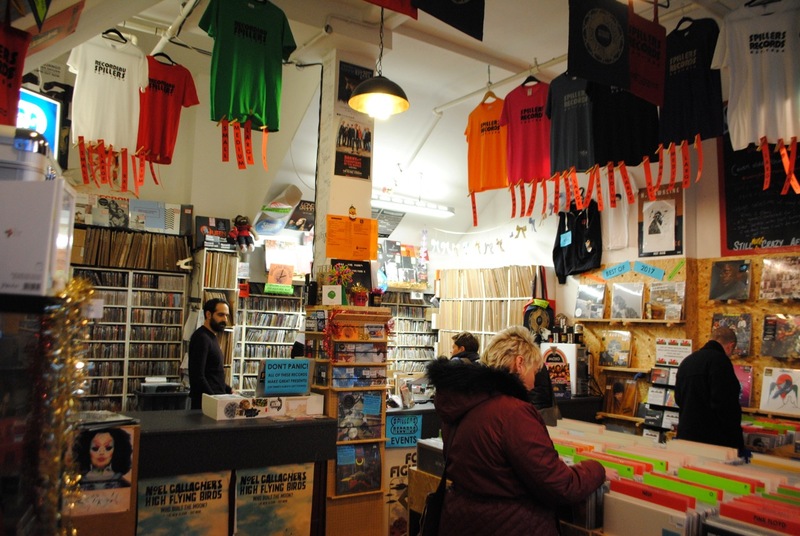 Spillers is more than a survivor: it claims to be ‘The Oldest Record Shop In the World’. Founded in 1894 by Henry Spiller in another of Cardiff’s arcades it is now in its fourth incarnation. The business appears to be thriving and a city like Cardiff is surely big enough to support a shop like this. But for all the periodic stories of vinyl’s revival, it will remain a niche interest. The culture has changed and the audio equipment required to support a vinyl collection is more expensive and more complex than that required by digital downloads. I didn’t buy anything in Spillers because I haven’t had that equipment for years. But it was pleasantly nostalgic to be in that setting again, amid the records sleeves, the music posters and the erudite staff. Spillers is not an anachronism but an analogue specialist in a digital age, the audio equivalent of a bespoke tailor. Record shops still have a place, and awkward teenagers have the virtual world to hang around in now.